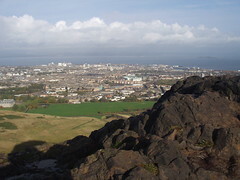 Edinburgh, October 2005, a photo by landhere on Flickr. What will happen in 2015 if Scotland has just voted Yes to independence and if it’s looking increasingly likely that England will vote to pull the rUK out of the EU, and potentially even out of the Internal Market? Read the rest of this blog posting on Arc of Prosperity. 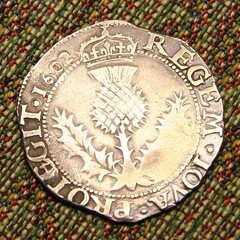 Scottish Thistle Coin 1602, a photo by Tropic~7 on Flickr. There was an extremely interesting blog posting on Wings over Scotland about the size of Scotland’s exports. This made me think about the consequences for the finances of an independent Scotland. First of all, the figure provided by WoS is $20,886 per capita, but that’s excluding oil. According to STV, Scotland’s oil and gas exports are worth about £7.6bn, which is about half the amount produced. If we assume that half of this is actually exported to England, we get a rough figure of £11.4bn, which is $18bn. Per capita this is $3400, so a very rough estimate of an independent Scotland’s exports including oil would be slightly more than $24,000 per person, which would make us number six in the World rankings, between Norway and Ireland. Author thomasPosted on 2013/01/26 Categories arcofprosperity, enLeave a comment on Will Scotland be richer than Norway after independence? 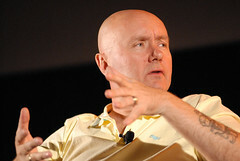 IRVINE WELSH: IN PERSON, a photo by EIFF on Flickr. Bella Caledonia has today published an original article by Irvine Welsh (of Trainspotting fame). It’s a very thoughtful piece by a writer who has spent a long time in England, and I strongly recommend reading the whole thing. 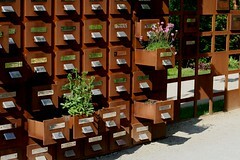 Please visit Arc of Prosperity to read the full blog post.